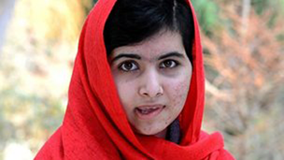 A teenage activist shot in the head by the Taliban is to receive the International Children's Peace Prize. Malala Yousafzai was targeted as she travelled to school in Pakistan after campaigning for girls' education. The 16-year-old was treated in Birmingham where she now lives. Women's rights campaigner and 2011 Nobel Peace Prize winner Tawakkol Karman will present Malala with the International Children's Peace Prize in The Hague, Holland, on 6 September. Marc Dullaert, chairman of the Dutch KidsRights Foundation, which awards the prize, said: "Malala was already one of the nominees in 2011, but this year the expert committee unanimously decided not to nominate other children, but to award the International Children's Peace Prize to Malala." Malala, then aged 15, and two friends were attacked on their way home from school last October. She was treated at the Queen Elizabeth Hospital in Birmingham and had a titanium plate fitted to help her hear. She began attending Edgbaston High School in March.